Having spent years going to events organized by peace groups, at which people tell each other they should stop “preaching to the choir,” I’ve started doing another kind of event. 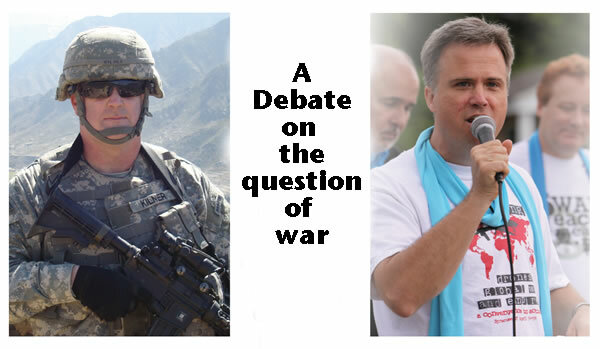 I debate war supporters in front of mixed crowds that include lots of war supporters, as well as people who haven’t really formed an opinion yet on the question of whether war is ever justifiable. The first one of these I did was in Vermont. It was to be a debate with a just-war-theory professor. I sent him my thoughts beforehand, and he immediately bailed out. So, I published my thoughts as a book. And the organizers found another similar professor who did the debate. ROTC students in uniform, veterans groups, and other people who had been subjected to at least a decade of U.S. television and text books heard arguments for the abolition of war, likely for the first time. People I spoke with told me they’d been moved. We didn’t take a good before and after count of people to numerically gauge the results — something I hope to do going forward. The second such debate I did was in Philadelphia. In both of these first two, my debate partner was not fully enthused by the role, I think. I got the impression — perhaps because it was part of the argument they made — that they preferred being more anti-war than other people. Of course “But I’m more anti-war than everyone else,” is not a very good argument for war. I think I may now have found a debate partner who truly believes in the justifiability of war. I don’t expect to persuade him otherwise, but I do expect to persuade lots of other people otherwise. Radford University, February 12, 2018, 7 p.m. – 9 p.m. Bonnie Hurlburt Auditorium (Hurlburt Building). Jefferson St. Radford, VA 24142. FLYER PDF. Eastern Mennonite University, February 13, 2018, 8 p.m. Common Grounds Coffeehouse, University Commons building, Eastern Mennonite University. 1301-1311 College Ave, Harrisonburg, VA 22802 FLYER PDF.